Corazon Tequila is part of the Gemini Spirits & Wine Company, which is a wholly-owned subsidiary of Sazerac, makers of Buffalo Trace, George T. Stagg, Sazerac Rye, and the Van Winkle family of bourbons. Under the Buffalo Trace banner, the company has done a tremendous number of special and experimental releases, including a single oak project which mused on the impact of different parts of a tree and similar wood on the same whiskey. For Corazon Tequila, they’ve drawn on some of their greatest assets (namely ex-bourbon barrels from some of the most in-demand whiskey) to explore the relationship between aged tequila and the whiskey that was initially used in that barrel. 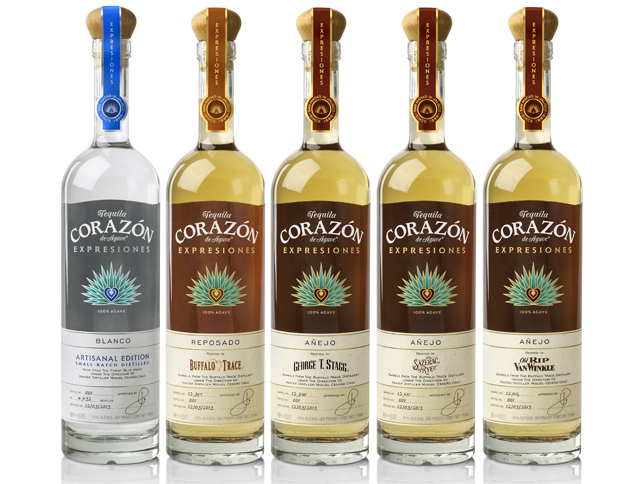 The collection, Expresiones del Corazon, is comprised of five releases: Buffalo Trace Reposado, George T. Stagg Anejo, Sazerac Rye Anejo, Old Rip Van Winkle Anejo, and Corazon Artisanal Edition Blanco. 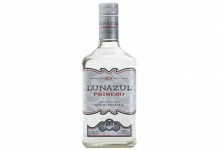 Corazon Artisanal Edition Blanco Tequila (80 proof / 40% ABV, $59.99) – sweet cooked agave jumps out of the glass in a tequila that has a very thick and lush nose. 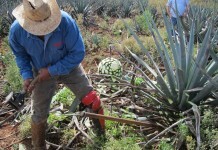 Underneath the sweet agave is a nice soft spice along with light citrus. The entry for the artisanal edition of Corazon is much lighter and thinner than the nose would suggest. It’s soft, light, sweet cooked agave and light vanilla. Things quickly ramp up in the midpalate with a solid white pepper kick, backed with a slight herbality. The sweet agave from the entry continues as a basenote with the spice on top and subtle lime. After the pepper kick, the spice level is dialed down for a slightly dry finish that features subtle agave along with solid lime peel. The finish on the Corazon Artisanal Edition Blanco is perhaps a little too dry, but the flavors are really nice, and we love how they captured and presented the core agave notes. 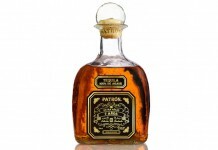 Corazon Buffalo Trace Reposado Tequila (80 proof / 40% ABV, $69.99) – although this tequila was aged 10 1/2 months in Buffalo Trace Bourbon barrels, it picked up very little color and has only the slightest tinge of gold. Even though this tequila’s age isn’t readily apparent in its color, the nose clearly shows off both its age and the barrel it was aged in. Briny oak is the featured note on the nose of the Buffalo Trace Reposado, and although the cooked agave note from the blanco is here, it’s more of a supporting bottom note than the star player. There’s also much more sense of the pepper notes on the nose here, with a nose that’s overall slightly spicy. As with the artisanal blanco, the entry for the Buffalo Trace Reposado is a slight left turn from the nose. The oak from the nose doesn’t lead; instead, it’s soft, sweet agave notes that lead the pack. As we head to the midpalate things get slightly spicy, but with far more balance than the blanco. Here the pepper and oak spices integrate beautifully and we get the first real sense of the bourbon that used this cask before the tequila, with an undertone of caramel, vanilla, and a hint of cinnamon. The finish on the Corazon Buffalo Trace Reposado is much better with the blanco, carrying along the sweet and the spice notes wonderfully for a nice, long, and balanced finish. Corazon George T. Stagg Anejo Tequila (80 proof / 40% ABV, $79.99) – aged for 22 months, this tequila has more color than the Buffalo Trace Reposado, but it’s still quite pale gold. George T. Stagg’s vapory elements come through on the nose here, which is oak dominant with an undercurrent of caramel. The nose is fairly assertive and not very inviting. As with the other two Corazon expressions, the entry is much softer than the nose. Here it’s cooked agave again but with more caramel supporting it. The midpalate has more oak and less pepper and towards the end of the midpalate you really get the solid influence of George T. Stagg. The finish is fiery but it’s also fairly sweet, and while these two elements do a nice job of balancing each other out, the resulting combination is less than pleasant. George T. Stagg is such a powerhouse whiskey in every way, using an ex-Stagg barrel to age anything is problematic. It’s like mixing with Fernet Branca – no matter what you do, it’s hard for it not to take over and dominate the character of the drink. Corazon George T. Stagg Anejo Tequila is an interesting experiment, but the result isn’t as delightful as we had hoped. Corazon Sazerac Rye Anejo Tequila (90 proof / 45% ABV, $79.99) – aged for 24 months, this tequila is ever so slightly darker in color than the one that came from the George T. Stagg barrels. Even though it was aged longer and has a darker color, the nose on the Corazon Sazerac Rye Anejo is much less oak assertive and much more balanced. While oak is a core note on the nose, it’s a much softer and more approachable oak. The oak is also supported by a clear strawberry note, vanilla, and the slightest pepper spice. The entry for the Corazon Sazerac Rye Anejo is much spicier than any of the other expressions; this may be because it’s the only one in the collection which is presented at a higher proof. Given its fiery nature, we actually expected the George T. Stagg expression to be presented at the highest proof. Briny oak is front and center in the entry with light vanilla and a far more subdued version of the strawberry from the nose. The oak in the midpalate isn’t overpowering but the heat from the increased alcohol gives the midpalate a much greater level of spice. This fiery spice also defines the finish which is long and slightly hot but then eases out to a nice, cool finish. There are some nice combinations of flavors in the Sazerac Rye Anejo but we don’t like how they all come together. Corazon Old Rip Van Winkle Anejo Tequila (80 proof / 40% ABV, $79.99) – aged for 23 months in Old Rip Van Winkle Bourbon barrels, the color on this tequila is just a touch lighter than the one that came out of the Sazerac barrels. The nose on the Corazon Old Rip Van Winkle Anejo is a nice mix of wood, caramel, and the slightest hint of cooked agave. While the nose is woody, it’s quite pleasant and well balanced. Of all the entries in this collection, the Old Rip Van Winkle is the most true to the nose with oak spice, caramel, and cooked agave. In the midpalate the spice intensifies a bit and we pick up some nice pepper spice and some of the flavor of the Old Rip Van Winkle Bourbon. These elements integrate wonderfully and stay together for a long and flavorful finish. Of all the releases, the Old Rip Van Winkle Anejo does the best job of integrating flavors, and the influence from the bourbon best complements Corazon’s core style. Of the collection, we liked the Buffalo Trace Reposado and the Old Rip Van Winkle Anejo the best. The Old Rip Van Winkle did the best job of integrating and balancing flavors and stands up well to a blind taste of the series. Odds are most consumers who buy these expressions of Corazon will do so based on the name of the bourbon which was previously aged in the cask used, and with the buzz surrounding the Van Winkles it’s probably going to be pretty hard to find. Quantities are extremely limited, with only 6,000 bottles of each variety available and will be on sale starting in June 2013. Overall it’s an interesting experiment from a company who continues to produce unique and innovative spirits.